The filing itself is not yet available on the Internet (except perhaps through certain subscription services). 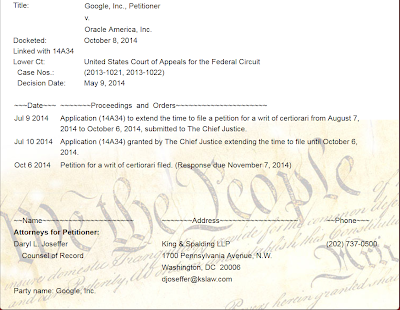 Oracle has a month to respond (unless it is also granted an extension). I'll try to obtain a copy of the submission and will comment on it then. Presumably Google is trying to sell to the Supreme Court the same old (but flawed) story about how the Ninth Circuit allegedly (not in my opinion though) established an interoperability exception from copyrightability. Judge Alsup in the Northern District of California bought that argument. The three members of the Federal Circuit panel, with Circuit Judge O'Malley writing the opinion, disagreed. 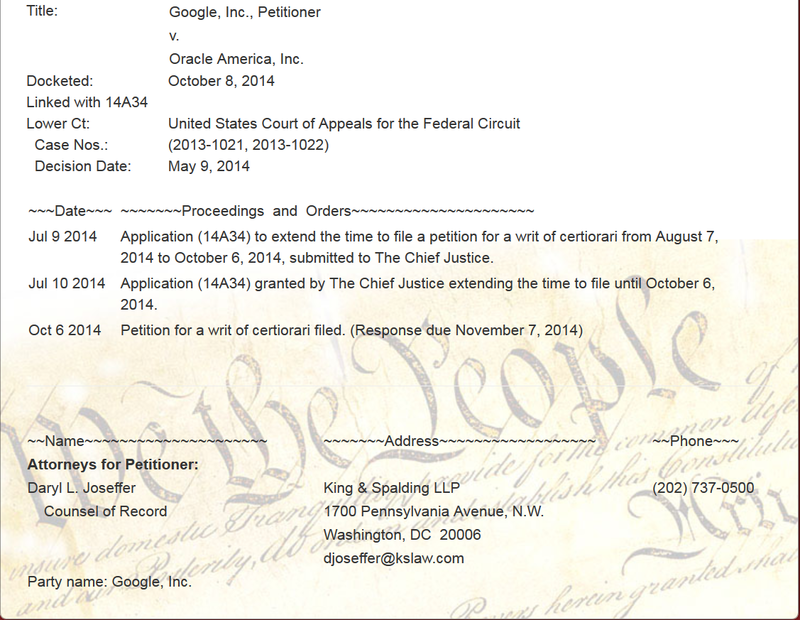 After Oracle's Federal Circuit victory I wrote up a refresher Q&A. At the time I thought Google was going to ask for a full-bench review, but instead it decided to proceed directly to the Supreme Court. This is a high-profile case; it's far more interesting from a strategic point of view than hundreds of smartphone patent assertions by major players (including Oracle, which asserted patents early on but since its appeal has focused exclusively on copyrighted material). The Supreme Court can't hear every high-profile case that someone wants it to review. I don't think this one needs to be heard at all: U.S. copyright law is perfectly clear (there is a low threshold for copyrightability and in this case, enormous creativity was conceded by Google's own counsel and witnesses), and Ninth Circuit law is clear as long as one interprets it reasonably. It's a safe guess, however, that Google will try to mobilize all sorts of advocacy groups, as it did before, and they will all say that the sky is falling on software developers and no one will dare implement APIs anymore (when, in reality, the Federal Circuit ruling strikes a very good balance, relegating interoperability considerations to the "fair use" analysis or, theoretically, FRAND/compulsory licensing questions instead of throwing out the baby with the bath water by saying that anything that can have functional relevance in an interoperability context isn't protected in the first place or, which is preposterous, could lose its copyright protection later on). With or without good arguments, there will be some noise about this "cert" petition in the weeks and months ahead; hopefully not just noise but also some signal. If the Supreme Court declines to restate the obvious, or if it elects to hear the case and affirms the well-reasoned Federal Circuit opinion, the case will go right back to the district court for a new trial on "fair use", a Google defense on which the 2012 jury was hung (which various commentators misinterpreted as a win for Google when in reality it just meant that the question remained to be resolved).